Isabel Bagsik is the Editor in Chief and Creative Director of Brown Papaya, a magazine featuring the beauty of all Pinays. Her design background and passion to create something representative of a broad range of Filipina beauty brought Brown Papaya into fruition. Featuring dozens of Pinays and sharing their stories, Brown Papaya is about reclaiming Filipina beauty thus redefining brown & beautiful. How did the idea for Brown Papaya manifest? What were you doing before Brown Papaya? Before Brown Papaya, I was a design intern with Kaiser Permanente in Oakland. Near the end of my internship program, right before I transitioned into my current design job at a design/art magazine, I started to develop Brown Papaya. My internship with Kaiser took up my whole day during the week (since it was a full time internship and the commute was at least 3 hours round trip each day), so I didn't have the capacity to start a passion project. As I found myself in a new job much closer to home, I gained more free time to invest into a personal project. I knew I wanted to create something that fused my passions for design and cultural identity. Specifically, I wanted to delve more into the issue of toxic beauty expectations within the Filipinx culture. Initially I was going to reach out to a few of my friends to be part of the photoshoot, but in the back of my mind I knew the face of a Pinay was much more diverse than in my personal pool of friends. 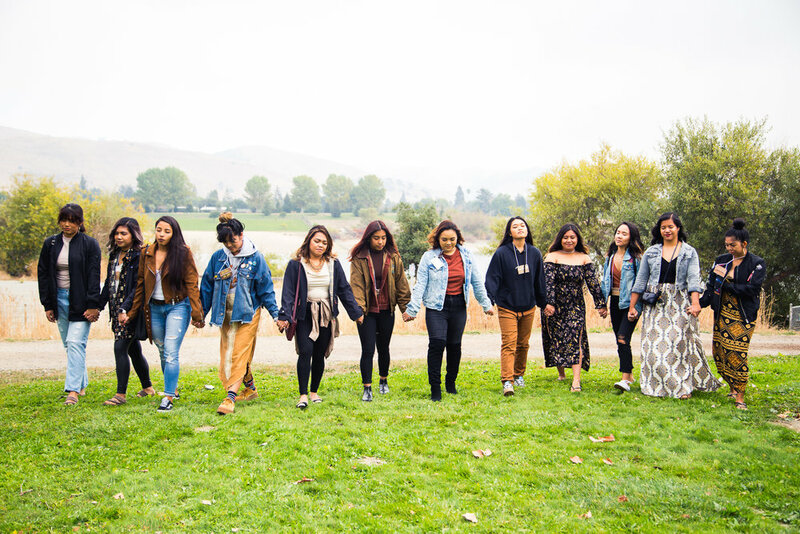 So I posted a call-out for Filipina/Filipinx womxn in the Bay Area to take part in the project. And the rest snowballed into the Brown Papaya magazine you see today. The name Brown Papaya has a lot of meaning behind it, were there other name/title choices you considered before it? I'm sure there were other names that flew through my mind before I landed upon "Brown Papaya", such as variations on "brown": "chocolate", "caramel", "golden", and then other words related to embracing a sunny glow, such as "sunkissed" (which I ended up using as the name of Brown Papaya's first event)! I'm what you might call an "organized mess", since I need reminders in different apps/methods, and scribble down ideas on whatever is at hand. So if I dig deep enough, I probably have a scrap of paper with some names before "Brown Papaya" was the winner! How important has diversity, inclusivity, and representation been to your work? Ever since my involvement in the Filipinx American community during my time in college (University of California, Davis), those three topics have been vital and are at the core of all I create and put into the world. For 3 years, aside from being a student leader in the FilAm community, I was also a graphic designer for a student center for marginalized, underrepresented groups (Filipinx, African Diaspora, Southeast Asians, Native Americans, Chicanx, transfer/nontraditional students, and grad students). I was exposed to incredibly selfless and passionate student leaders that put in their all to produce events, workshops, conferences, and retreats for their respective communities. And I was granted the opportunity to design all the components needed for their events, from social media flyers, to Tshirts, to nametags & pins. I realized the power of design, especially since many nonprofits cannot afford to invest in a design studio to brand themselves. Design can really elevate an event or project based on how the org represents themselves through their graphics. Diversity, inclusivity, and representation have been at the root of my work for Brown Papaya because I've been frustrated by how limiting "beauty" looks like in the media. This in turn greatly affects the confidence and notion of what "beautiful" means to a young person of color, especially young womxn. Since I'm not seeing enough range in the spectrum of Filipina/Filipinx womxn, then I decided to create those visuals myself. Do you see a shift in beauty standards/what is seen as beautiful in the mainstream? Are you working towards more of that? I grew up in an area that followed a predominantly white culture, but that shifted when I moved to a different city at 12 years old, where the majority was Filipinx folks. That was a huge shift for me, and as I got older, my idea of beauty expanded from "blonde and blue eyes" to every shade, size, and hair texture that people come in. I double majored in Design and Technocultural Studies, and the latter made me more aware of how technology impacts society. After graduating, I wanted to make sure the content I viewed on my social media would grow me creatively and personally, instead of making me yearn to be something else, so I cleaned out who I was following. I removed a lot of "beauty/fashion influencers" that had the same basic aesthetic and I'm pretty sure all were quite slim. I began to follow more WOC (womxn of color), POC (people of color), QTPOC (queer/trans people of color) of all body shapes and skin tones, doing cool and important creative or social work. So my personal Instagram feed, and thus my taste in pop culture, has shifted. I'm definitely seeing a lot of people putting out work to shift the beauty standards to include people that have often been marginalized and appropriated for their fashion or culture. I definitely want to shift the culture and promote that beauty cannot and should not be defined by one face or body type. Whether that's through more photoshoots, or collaborations, or just dialogues with people. The conversation should never end so we can normalize the diverse range of beauty everyone already has to offer. I'm blessed to be able to design and create 24/7 during regular work hours, then afterwards for whatever personal project I'm working on next. In general, I love how design fuses so many things that are interesting and fun for me, that I don't have to stick to one discipline. Depending on the project needs, I can utilize photography or interview people to understand a certain problem, or I can design a website to promote a project or create a printed magazine for a tactile, intimate experience. Design doesn't just need artists, it needs people of differing backgrounds who can think up creative and innovative solutions to problems. How was your idea received among participants? Among the Fil Am community? When I first posted a call-out for Filipina/Filipinx womxn last October 2017 to take part in the photoshoots, I was pleasantly surprised by the unexpected, overwhelming response. Hundreds of people retweeted and shared the original post (even getting retweets by Asia Jackson, a Filipina/black actor and model, and Ruby Ibarra, a Filipina Bay Area rapper). Quite a few messaged me individually on how important this project is, then shared the universal struggles and experiences battling beauty expectations imposed upon them by family and their upbringing. I got so many messages with almost the same stories, thus solidifying it for me on how much this project means to so many. I also got quite a few messages from folks from other states, such as Texas and New York, wishing they could take part (and even out of the country in London). Then when the magazine finally launched, new faces began to reach out to share how Brown Papaya impacted them and allowed them to love themselves a little more. It was a humbling experience to hear these accounts, and I am beyond grateful to everyone who supported this project at every step of the way. Do you have plans to publish more Brown Papaya issues? At the moment, I'm not jumping into another project just yet. As this was a year in the making, I want to replenish my creative soul and not create, but consume art now. This way, when the time comes, I'll be ready to start a new project rejuvenated. However, there definitely has been incredible interest for different branches of Brown Papaya, such as a publication for the Filipino male narrative, and one for the LGBTQIA+ experience. Social media has its pros and cons, but if you are mindful of the content you are consuming and the way you utilize your platform, it can be instrumental to your growth both personally and creatively. At the design/art magazine I work at, many of the illustrators and artists I work with share that building their social media platform has been influential in the job opportunities they receive. Social media, specifically Instagram and Twitter, have played a huge part in who I've connected with just through Brown Papaya alone. But I've also used it to see what creative/art/cultural events were happening locally. People I respect and enjoy their content, I also keep an eye out when they share resources/books/movies/events, etc. that they recommend! By curating my social media and newsfeed, I've been able to open up opportunities and experiences I would have never imagined. When I start to lose sight of what I'm doing, I think back to how difficult it was to begin this creative journey. I'm fortunate that my parents ended up allowing me to pursue my creative passion, but it wasn't easy. I fought to choose the school I somehow internally knew was for me, and cried out desperately that I could not take any more computer science classes. I got my first mini panic attack during a midterm review for a comp sci class, and I felt so withdrawn from friends because I had to use whatever free time I had to attempt to understand my classes. Finally, when my parent visited me in college, I burst into tears and rambled that I could not uphold our original compromise that I was to minor in Comp Sci if I wanted to major in Design. They could feel I was drowning, and unexpectedly, they quickly reassured me that it was okay, I can focus on Design as long as I worked hard. And ever since then, I made sure to take on whatever creative opportunities came my way to prove that I was serious, that this wasn't some "hobby". Creating is in my blood and my lungs, and I don't know how else to breathe in this world unless I am creating. I'm taking this time for a personal break, to focus on myself. I plan to revamp my design portfolio, redecorate my room, and dive into other art forms that I've always wanted to practice (I have so many canvases ready for me to paint on!) After all that, I hope to dive back into creating something collaborative with the community, expanding into other identities. I hope to work with other people of color, the LGBTQIA+ community, and explore different media (such as video or audio formats). But I am always open to collaboration, so feel free to send me an email, share those ideas! Photos courtesy of Isabel Bagsik and Brown Papaya. Isabel’s profile photo is shot by Lee-Ron and the group photos are by Vianca Natividad.